‘All change, please!’ Except the guard didn’t say that. Instead, as we sat – packed like sardines – on the train from Copenhagen airport, the PA system indistinctly informed us something was about to change. Our end of the train was going no further. Only, he said it in Danish, and bad English, so it wasn’t either helpful or clear. And we’d only just got acquainted with the couple out to celebrate Mother’s Day, whom we were sqeezed far too close to for polite company. So we ran for it at Malmö. Even Daughter made it, but only just. She was further in, so had longer to get out. We’ve had Birdie with us for a week. She does incomprehensible subjects at university, along with Daughter. It means we’ve tried to explain some of the weird ways of Sweden, and we were working on the bottle and drinks can deposit system when we realised the smallest amount had doubled. After a while I hit on the reason for this. The place no longer has 50 öre coins, so can hardly have a 50 öre deposit. No small change here. Birdie is staying on for the summer. Not with us, but with one of the country’s leading universities, which will mean a considerable change for her. She has spent her week here being led from one outdoor café to another. She’ll think we do nothing but eat. (She’d be right.) When not being force-fed cake, she has read incomprehensible books. Speaking of books, I went into town (no, I never learn…) and wanted something from the bookshop. You know the drill by now. It had moved. Only about two doors down (or do I mean up? ), so I found it easily enough once I could see I’d overshot. When I’d bought what I came for (amazingly they had it), I discovered it had changed names as well. It is now a completely different shop, except it’s the same, really. To me it will always be Larssons Bokhandel. Went to look for the next thing on my list. Definitely didn’t get that. Mainly because the department store wasn’t there. In its place was a building site, and the only shop open for business was a – new – chemist’s. Presumably to make up for the halving of the old one and the moving of the door which they hit me with last year. And speaking of the bus tickets and being stranded; the unions have called a strike for Monday. Either they strike all the time, or we are simply extremely gifted at turning up when they do. May not be able to get rid of the Resident IT Consultant quite as smoothly as planned, because of this. 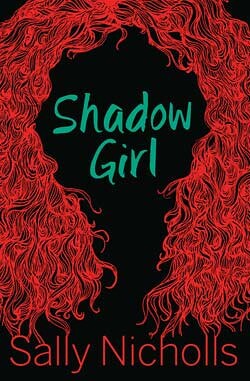 How many dystopias featuring a girl named Kyla can a witch take? As long as they are as fantastic as those written by Caroline Green and Teri Terry, then you can keep sending them my way. 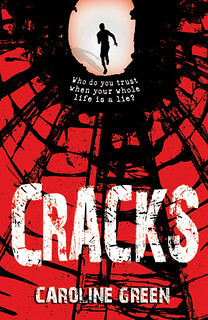 I have belatedly come to Caroline’s second novel Cracks, and it’s the sort of book I’d happily give to anyone. I defy any young (-ish) reader not to devour this book in very few sittings. What made me so content was the fact that it wasn’t just like every other book. Some are. This one was ‘itself’ and all the better for it. 14-year-old Cal thinks he’s going crazy. He isn’t, of course, but while I wondered if he was about to be abducted by aliens, the truth is far, far weirder. Most interesting, in fact. Different. Set in the not too distant future, the world is terribly different from the one we know. But as with any good dystopia, you can see how easy it’d be for us to end up there. So far Cal has led an unhappy life, but pretty normal. Soon this changes to strange, confusing, and almost hopeful. I believe there is a sequel, so there’s plenty of scope for more developments. You don’t have to read further, but you will probably want to. How can anyone not love the food in the Famous Five books? I just don’t get it. I obviously liked the children and I liked their adventures, but I’m pretty sure I rated their food above everything else. Oh how they ate! Lots of it, all the time. And it sounded so tasty, too. The food seems to be one of the things people have to point out as a negative aspect of Enid Blyton’s books. That, and the class distinctions between the children and the baddies. But the class stuff was lost in translation. We didn’t do class (I won’t say ‘at all’ but not like that, so it wasn’t noticeable). Hence we didn’t see it. My best friend during the Blyton years kept saying ‘but they eat all the time.’ She enjoyed the books, but clearly felt the food got in the way slightly. I thought the books were so truly wonderful it didn’t even occur to me to apply any literary analysis. Not that I could have, even if I’d known about such things. They wake up in the morning and come down to (that phrase, ‘come down to,’ is so wow, in itself) a cooked breakfast, provided by the mother/aunt. And if they stayed in (hah) there was lunch and tea and dinner. Cake for tea, and puddings. What’s not to like? There was food in the larder. You could help yourself. If they went out on adventures they made sure to pack all sorts of goodies. Heaven for a fat little reader. It seemed to be allowed. I suppose they ran so fast chasing baddies that they used up the calories. Ice cream. Sweets. Crisps, probably. They led charmed lives. They really did. Boys will be boys. They were – mostly – just the same back in Roman times. Or do I mean Greek? Caroline Lawrence has written her first Barrington Stoke story, and it is both an exciting read and quite educational for people like me. If you’re a bit shaky on the Classics, then The Night Raid is for you. It begins with the fall of Troy, when two young boys, Rye and Nisus, flee for their lives, having lost family members. Both want revenge, but first have to start new lives with the leader of the Trojans, Aeneas. The reader learns what happened to the Trojans in exile, and how they arrived in Italy, years later. If the story sounds at all familiar, it will be because a chap called Virgil wrote a poem called the Aeneid, and Caroline has borrowed from that to tell us what happened to the teenagers, Nisus and Rye. I think it’s fantastic the way an author can take something old and seemingly difficult and bring it to a new audience by re-writing something that many of us will happily avoid for as long as we possibly can. Thank you for educating me a little bit, Caroline. No. It’s me on holiday. I mean, it’s where I am going to be for a week or two. 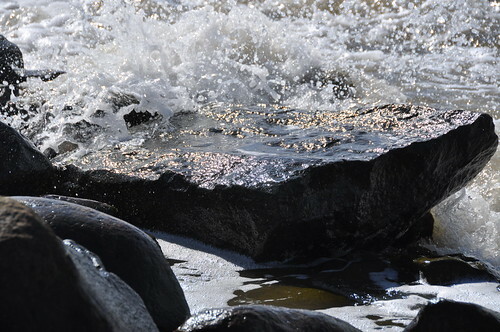 Listening to the water. Dipping my toes into it, even. Possibly dipping more than the toes. Sitting in the sun. Some people put it better than others. That’s why I am borrowing someone else’s words to talk about stealing. Simply because they said it so well. First it was Nicola Morgan who discovered that ‘pirates’ were offering her ebooks online. She has worked hard to bring them out, so wasn’t terribly pleased to find that people were that keen to avoid paying the mere £2 she’s asking for her books. Nicola reckons ‘pirate’ sounds much nicer than ‘scummy thief’ and that it’s time we stop thinking of these book thieves as rather loveable pirates. She’s right. Then came Joanne Harris who discovered her fans tweeting happily about how and where to best steal her books. Except if you use the word download it sounds rather better to those who do it. She wrote a great blog post about it, and she doesn’t just mention her own – lack of – income, but that of everyone else in the book business, who will not have the money to feed their families or pay the bills. It’s worth noting, too, that this is the way to lose the publishing business, and anything else connected with it, like libraries. Which is just as well, really, as there will be no books written, that could be published, or that might be borrowed from your local library.